The most satisfying thing as a storyteller is when every loose thread comes full circle. I love watching characters complete their journeys and come full circle. Dan Harmon's story circle puts it best: they return to their familiar situation, having changed. The thing about Arrow is that it's a show that often endlessly chases rabbit trails, only to realize — too late — that they've strayed far from the path and have lost the interest or attention of their viewers. The show's proclivity for doing this has not been lost on me throughout season five. At its best, this year had some interesting moments. But at its worst, it was boring and often downright baffling. I'm not in the business of telling people that one great episode can redeem an entire season of not-great ones, but if any episode was going to try and do that successfully, it would be "Lian Yu." Oddly enough, the season five finale feels like it could — and should — be a series finale for the show. The way that Oliver came full circle in his journey to and off of the island was one of the main points of focus. There were blatant parallels (Arrow is not known for their subtlety, but in this case I think it actually worked to their benefit) between the Oliver Queen we met five years ago and the one who refuses to kill Adrian Chase in the present-day. In spite of the fact that the show threw a "cliffhanger" that wasn't really a cliffhanger, I still found myself emotionally invested in the episode and its characters. Let's dive into what "Lian Yu" did well and why it might be a good jumping point for season six. It's no surprise to anyone that I've zoned out of the flashbacks for years now. Thankfully, the final Bratva-related flashback for this season was simple enough to follow: Constantine and Oliver duked it out because only one of them was getting off that island alive. (Spoiler alert: it was Oliver.) What's so significant about the parallelism here though is that Oliver did whatever it took to get himself off Lian Yu. He wanted to avenge his father's death and he did everything necessary to ensure his survival. At the beginning of the series, a lot — if not all — of Oliver's behavior is centered on this idea of self-preservation. He did things alone because he needed to be alone. He lashed out to protect himself. He was traumatized by everything that happened to him — all of the torture and the loss. The Oliver Queen we know in the pilot episode is driven by nature, not nurture. And then there's the Oliver Queen in "Lian Yu." Adrian Chase is kind of poetic. Okay, he's really poetic: he sends everyone Oliver loves to Lian Yu — to purgatory — and demands that Oliver kill him. In doing so, Chase hopes to prove that Oliver hasn't really changed and is still the same heartless killer who left Lian Yu five years prior. In order to see who Oliver truly is, Chase traps him in purgatory. If you're spiritual and believe in the idea of purgatory, it's always been likened to a waiting room. Either you are deemed worthy of heaven or your sins outweigh the good things you've done and you're sent to hell. What will happen to Oliver's soul at the end of the episode? That depends on what he believes to be true of himself and his soul going into this mission. Oliver has spent this season trying to figure out the kind of legacy he'll leave behind. "Lian Yu" focuses pretty heavily on the idea that parents leave behind legacies for their children — some of those legacies involve how the parent has lived and acted their entire life; some of those legacies are based on one decision. But what is so significant is that these people have changed: Oliver, Slade, Malcolm, etc. Everyone who makes a major decision in this episode, save for Adrian Chase, has been changed; they're not the same people they were when they first landed on the island. Oliver has decided that his legacy is going to be one of a passionate, caring, self-sacrificing father. There are some really incredible parallels here between Robert and Oliver's relationship. For starters, Robert Queen killed himself to atone for what he did but also give Oliver the chance at life. At the episode's end, Oliver makes a sacrifice for William — he chooses saving his son over saving his friends and family who are still trapped on the island. But what was really poignant to me was the parallelism between the suicide of Robert Queen and the suicide of Adrian Chase. In the end, Adrian knows that Oliver won't break — he's been changed by the love of his friends and family, and he refuses to kill him because of that. So in order to execute his master plan of taking away everything Oliver loves, Adrian takes his own life. Oliver had to watch Robert die out of love; he had to watch Adrian Chase die because of evil. The one complaint that I have in regards to the whole Oliver/William storyline was that we never got the chance to really explore what Oliver was like as a father. We had one scene of Oliver playing with his son, but that's about it. So it's kind of problematic that the entire emotional poignancy of the scene at the end was carried by Oliver's relationship with William. He seems affectionate enough around the kid, but until he mentions him by name, sometimes I legitimately forget that Oliver even HAS a son. I guess that the problem is so many of us took issue with the baby mama drama plot that it lost any and all of its potential. Nevertheless, I bought was Stephen Amell was selling because his desperation to save his son was palpable. Interestingly enough, while we spend a lot of time with Oliver in this week's finale, we don't actually spend a lot of time ON him. Thankfully (or not-so-thankfully) Arrow chose to spend an inordinate amount of time this season with heavy-handed dialogue and symbolism about identity and darkness, so by the time we got to "Lian Yu," there was nothing much left to say. Disappointingly though, this also led to less screentime for Slade Wilson than I would have liked. Even so, I appreciated the parallels between the two characters in the present-day with their history. 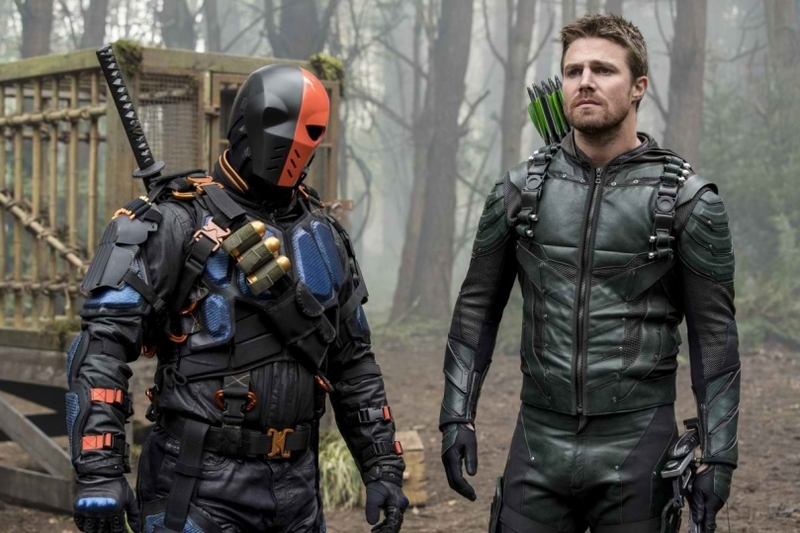 Slade Wilson will always be the best villain in Arrow for me. And it's not just because he's sassy or clearly on Team Oliver and Felicity Need to Bone Again Soon, but because he's genuinely complex as a character. He's not purely evil, and not even evil for the sake of being evil. He acknowledges, when Oliver approaches him, that he killed Moira. The right thing for Oliver to do would be to kill him. But Oliver has taken to look at everyone recently through redemption-colored glasses, and instead of seeing all of the pain that Slade caused him, Oliver sees all of the potential. Ultimately, Slade's downfall as a villain was that he cared too much. I know, that sounds like one of those things you say in a job interview when they ask about your weaknesses. But it's true. Slade loved people and because he lost them, he snapped. That's not like Damien, who just wanted to watch the world burn or Ra's, who... I don't know, wanted to rule the world with a sword and misogyny? I'm still trying to figure out his deal. Slade's passion tuned in one direction is admirable — it's love and fire. Tuned the opposite way, it's dangerous — it's rage and vengeance. Oliver is desperate and even though he knows Slade has done horrible things, especially to him, he also knows that there's no one else better suited to take on Lian Yu with than Slade Wilson. And our villain rises to the challenge, pretending to double-cross Oliver in order to take down Adrian Chase and staying behind to protect Team Arrow. Slade Wilson isn't a good dude, but he also isn't heartless. You can see during the conversations Oliver has about his son that Slade understands and empathizes. There's something special about the bond between Slade and Oliver (and insanely complex) that can never really be replicated in another relationship on the show. Their friendship was tumultuous and the aftermath of it — and Slade's rise as Deathstroke — is as well. Slade is both Oliver's greatest enemy and also his greatest asset. Like I said, it's extremely complex. But that's what makes it so GOOD. And that's why I was so excited about Slade joining the team during the season finale. Again, I wish I would have seen even more of Slade but given Manu's apparent dislike for working on the show, I'm afraid this might be the last we see of his character. Hell tends to bond you close to the people in your life. But so does purgatory. Speaking of purgatory and spiritual allegories, let's talk about atonement, shall we? Don't you sometimes forget that Felicity and Thea were almost sisters-in-law? Arrow does too, don't worry. Thankfully they seem to find time to squeeze in a few scenes for us Thea/Felicity friendship fans, and "Lian Yu" was one of those times. Malcolm Merlyn — again, I just love that Malcolm got recruited to join Team Arrow — is tasked with getting Curtis, Baby Mama (blegh, fine, Samantha), Thea, and Felicity off the island. Things don't quite go as planned, mostly because the third villain in this trifecta, Digger Harkness, has decided to turn on Oliver and work for Adrian Chase. With Digger and his cronies on the team's tail, the group is a little bit distracted. And as we all know on Lian Yu, there are traps. Thea unfortunately falls into one when she accidentally steps on a land mine. Don't worry, Thea, Felicity has done this too. You're not the first one. Understandably freaked out, Thea panics and before she's given enough time to process her impending death, Malcolm shoves her out of the way and takes her place on the mine. Thea is distraught but with Digger quickly approaching, the team has to leave Malcolm behind to his inevitable death. John Barrowman posted on his Instagram this week that he is, indeed, not returning to the show but that he had a blast (no pun intended) playing Malcolm Merlyn all of these years. And I've had so much fun watching him chew scenery on this show, it's unbelievable. Malcolm was incredible and he was terrible, all at the same time. I love John Barrowman and will miss him tremendously, especially for all of the fun and dry wit that his character brought to the show. He went out in the best and most redemptive way that he possibly could — protecting the woman he loved most in the world; and perhaps the only person left in the world he really did love. Adrian Chase has a failproof plan to kill Oliver's friends — if he dies, a detonator will set off explosive devices that are scattered all across Lian Yu. Either way, Oliver was always screwed. But when Adrian makes Oliver choose — either save William, or save his friends and family on the island — Oliver makes the decision to save his son. Adrian Chase always struck me as an interesting villain. He's the kind of person Oliver could have become if he had totally given into the darkness. It's almost like Adrian is the physical manifestation of Oliver's darkness: self-sabotaging, selfish, purely dark. Oliver also lost his father, but Robert's death was a sacrifice. Adrian's father died because he was evil (I mean, Robert Queen was no saint but he did love his family). Adrian's crusade was based on the death of his father, and so was Oliver's. Both men have suffered and both men have to ponder what kind of legacies their fathers left for them. It's easy to see the result of those decisions: Adrian chose hatred and evil and revenge, while Oliver sought redemption and continues to seek redemption for his dad and even his own actions. Funnily enough, Adrian seems touched by the fact that Oliver and William will have each other. Or he's just crazy and is mocking them. Either way, the story ends the same: Adrian kills himself in front of Oliver and William (it's okay though, because apparently Adrian said he won't remember this all anyway. Uhhhh, I tend to disagree but sure. ), and explosives ignite all along the island presumably killing everyone in the Arrow cast. Honestly, I could have done without the dramatic ending. We all know that most if not all of the characters (with the exception of minor characters) will survive into season six. In spite of the fact that the cliffhanger was anticlimactic and doesn't lend me to think that the entire cast of the show is dead, it was a pretty interesting way to end the season. This year, Arrow was a season containing some good and great episodes in a sea of mediocre ones. The writers weren't sure how to balance a new Big Bad with a new team and a similar theme that we've seen across the years. Add to that even more flashbacks and you have a recipe for mediocrity. With the show renewed for a sixth season, I'm interested to see where the writers will take the characters and their journeys from here. I'm hoping it's better than what we had to endure this year, but maybe that's the optimist in me talking. See you back on Lian Yu next season, all! Stephen Amell slayed this episode and remains the MVP. "You and me, kid. Like old times." Whyyyyyyyyy was Baby Mama even there? I get that William was kidnapped but I honestly could not care less about her. And the show tried desperately to make me like her by having her share a scene with Felicity. Spoiler alert, writers: one scene with the two women together doesn't erase the craptastic storyline you wrote for both women. I did not appreciate the scene at all because it was a clear attempt at baiting us into liking Samantha since she's apparently Team Olicity. Blegh. I'd rather we just forget Samantha even exists and move forward without having to dredge up that horrid story ever again. "I see you haven't lost your feistiness, Ms. Smoak." "Feels like a lifetime ago." "For Shado, it was." OH SNAP. I did quite enjoy the Talia vs. Nyssa showdown but it was still too short. Two Canary Cries was interesting. I still don't care for that particular element of either Black Siren or Black Canary. However I did enjoy Lance hitting Black Siren over the head. I didn't get a chance to talk about it above, but that scene with Moira Queen broke me. She was such an interesting and complex character, and the phone call between her and Oliver broke my heart and made me cry. What did you all think of the finale? Sound off in the comments below!